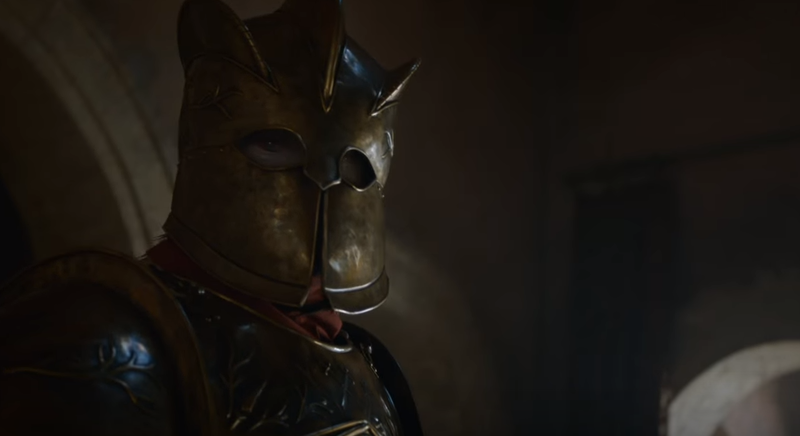 After months of rumours, theories and few facts, the Game of Thrones season six trailer is finally here – and it answers a lot of questions (but in typical Thrones style, raises more). There’s almost too much to handle in the thrilling and action-packed new trailer, in which most of the show’s many main characters make an appearance. To make this whirlwind of information a little more digestible, we’ve broken down the key things to take away from the new trailer. Here are seven things we learnt about season six from the trailer, which you can watch at the bottom of the page. 1. The Lannisters want revenge. Predictably, twins and lovers Jaime and Cersei want revenge for all the terrible things that have happened to them since son Joffrey married Tyrell schemer Margaery. This follows the assassination of daughter Myrcella in Dorne in the season five finale and Cersei’s ordeal at the hands of militant religious group the Sparrows. 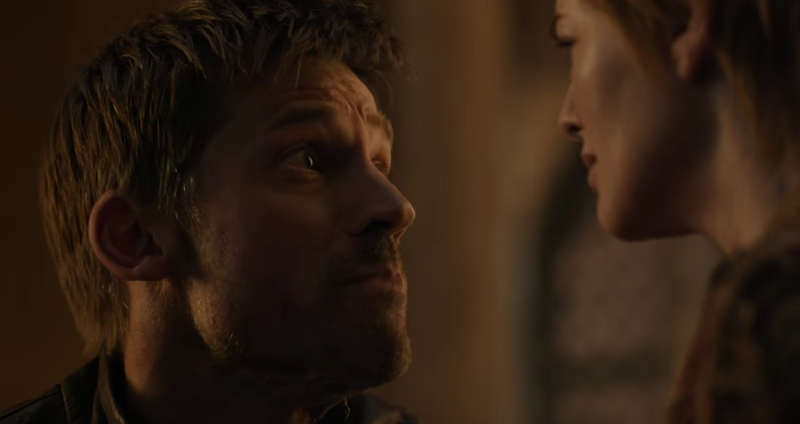 In a scene that shows the twins reunited after a season apart, Jaime assures his sister: “We’re the only ones that matter. Everything they’ve taken from us we’re going to take back – and more.” That sounds promising! 2. Sansa has successfully escaped the clutches of sadistic husband Ramsay. Finally, there’s some good news for the eldest Stark daughter. 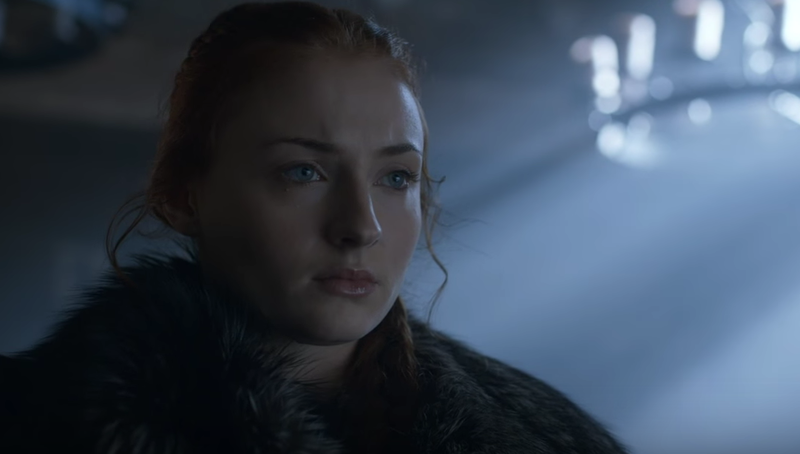 After taking a huge jump from the roof of Winterfell in what would be a suicidal move in any other show, Sansa is shown alive and well in the trailer. 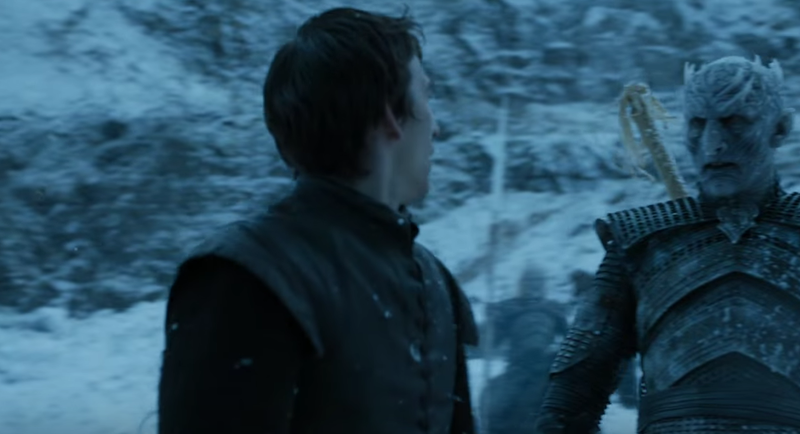 Meanwhile, Ramsay looks befuddled as he shares a wordless glance with his father Roose Bolton. In another scene, we also see Theon is alive (although not so well). He no longer appears to be with Sansa. 3. Daenerys has joined a tribe of Dothraki. It’s not clear whether she is their prisoner or has simply joined the group of travellers, nor whether anyone recognises her from the time she ruled over them as a khaleesi (Dothraki queen). She makes her way nevertheless to the Dothraki city of Vaes Dothrak, potentially to ask for a much-needed alliance after a disastrous season five. 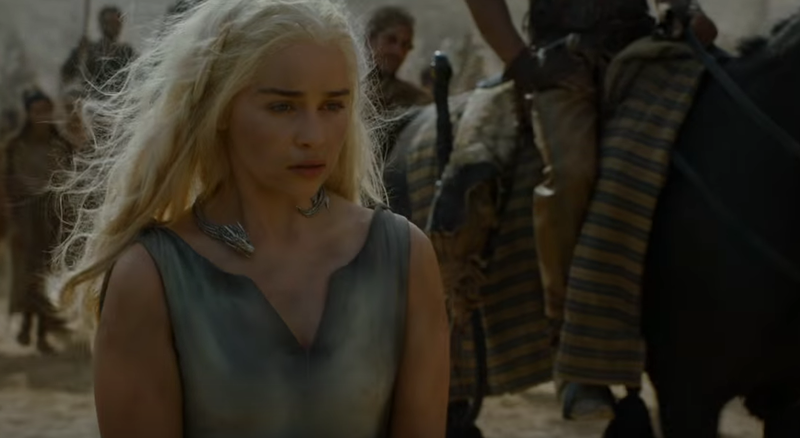 Meanwhile, we learn that Jorah and Daario are hot on her trail as Jorah discovers the ring Dany planted at the end of last season. 4. Cersei is taking on Lancel Lannister and the Faith Militant with her mysterious new bodyguard. 5. The long awaited Tower of Joy flashback is upon us. 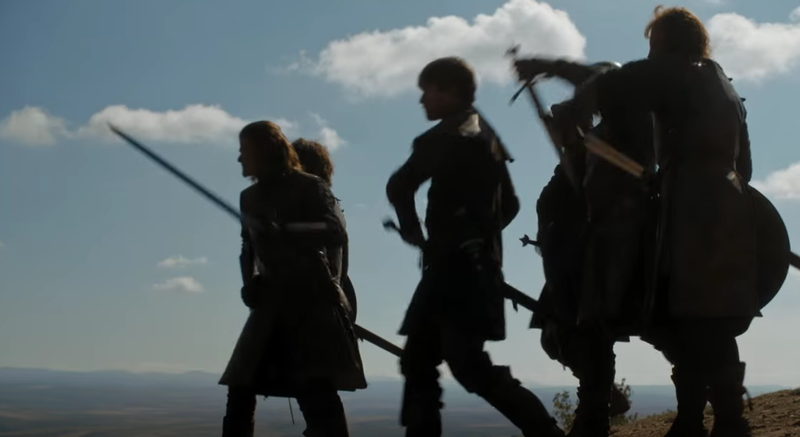 It appears rumours about the new season featuring a flashback sequence to Robert’s rebellion and the Tower of Joy are true, with a blink-and-you’ll-miss-it image of a group of armed men. The one at the front looks suspiciously like a younger version of Sean Bean’s honourable hero Ned Stark, who was ruthlessly decapitated in the first season. A later scene shows a battle against Targaryen soldiers. Book fans will know that the Tower of Joy was where Ned discovered his sister Lyanna at the end of Robert’s rebellion and promised to keep a secret for her. Fans expect this scene to reveal the long-kept secret of Jon Snow’s maternity. 6. Bran meets a white walker. It’s not clear whether this scene is taking place in a vision or reality, but the trailer’s thrilling climax shows a glimpse of Bran and the same scary white walker leader we’ve seen throughout the series. This scene is probably a vision, as Bran is standing upright, but who knows what wonders a season away with the Three-Eyed-Raven could have worked. 7. It looks like Jon Snow is dead. The trailer opens with an image of Jon Snow in the same place we left him, lying lifeless in a pool of his own blood. 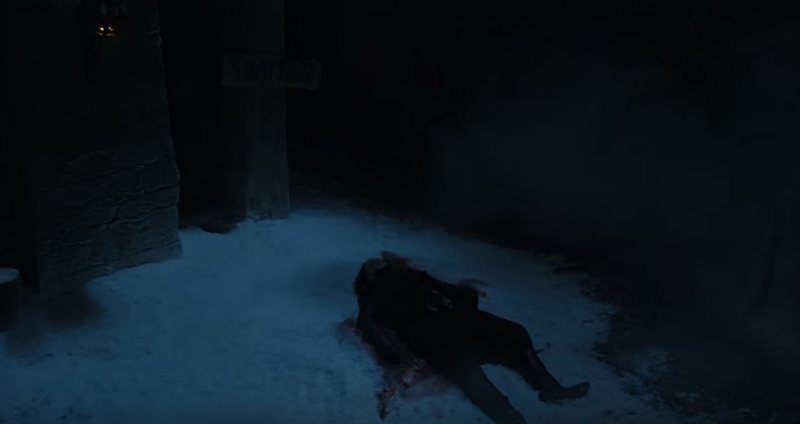 If this imagery wasn’t enough, a Davos voiceover adds: “He’s gone.” However, we doubt this will silence the naysayers – after all, Melisandre’s still lurking around in the trailer and Davos appears to draw a sword to protect Snow’s body. BONUS. “Wicked Game” fits perfectly in the Game of Thrones universe. What a great choice of song for the trailer. Season six of Game of Thrones will be simulcast on Sky Atlantic at 2am on April 25, at the same time it airs in the US and will be repeated 9 pm the same day. If you’ve missed any of the action so far, every episode of seasons 1-5 will be exclusively available to watch on Sky Box Sets from March 14.